Today, the Advanced Laser Interferometer Gravitational-Wave Observatory (LIGO) is expected to announce a monumental discovery that is 100 years in the making. Theorized by Einstein’s general relativity in 1915, gravitational waves are ripples in space-time, similar to sound waves, but much tinier. The search has been ongoing for decades, with no results. Until now. 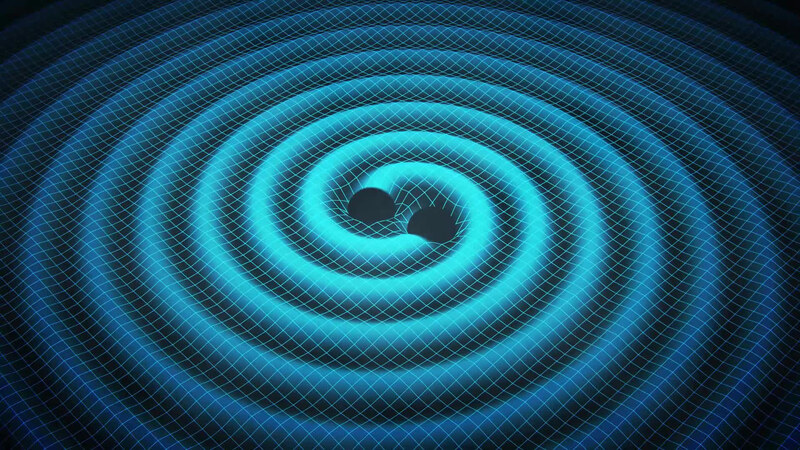 Gravitational waves formed by the merger of two black holes. LIGO has the most sensitive gravitational wave detector ever conceived – in two interferometer facilities in Livingston, Louisiana and Hanford, Washington. They use a laser split along two axes to give an in-phase beam. If gravitational waves along one of the axes affect the beam, it will be out of phase with the other beam. When they recombine this phase shift will create an interference pattern that can be used to measure the intensity of the gravitational wave. See my earlier post for a deeper explanation of LIGO. Gravitational waves are thought to originate from the most intense gravitational interactions in the universe, such as a supernova explosions, orbiting neutron stars, or black holes. In the case of today’s announcement, I’ve heard rumours that the signal they measured was matched to the theoretical signature of a black hole merger. If true, this would create an entirely new field that we would call gravitational wave astronomy. A panel of experts will likely be on hand to discuss the deeper implications of this finding, so if you want to watch the announcement, go here. I’ll be tweeting like a madman all day, and maybe even doing some media calls. Enjoy the day! There’s a big buzz in the air in the Physics world, a true disturbance in the force. PrevStill More Hidden GalaxiesNextBlack Hole Merger Confirmed!